A few months ago, my friend Corrina from Hawaii got in touch about doing a hike in Banff National Park. She has organized the whole trip and tomorrow I'm driving ten hours to meet her and another friend, Laura, in Canmore. The next day we will start our three-day/two-night hike of the Skoki Loop; a 37.7km hike with 1,796m elevation gain. Here is a look at what I've packed. 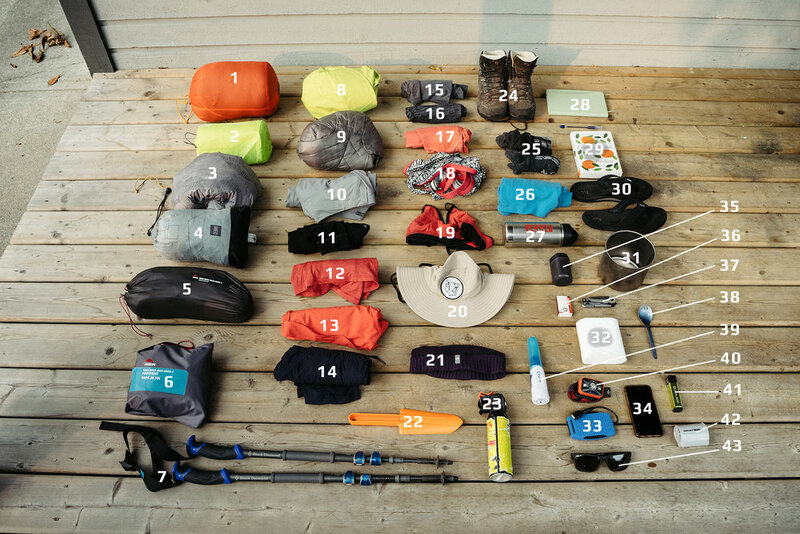 This is by no means a minimalist hiking list. I've carefully balanced comfort and weight while planning out what I would take. This year I treated myself to the Patagonia -1C bag. It packs up smaller and lighter than my Big Agnes winter bag and is warmer than my 15-year-old 7C synthetic bag. I've used it a few times already this season and really love it! I bought the Therm-a-rest NeoAir Trekker after borrowing Stu’s for the West Coast Trail last year and also seeing friends use theirs. I've had bad luck in the past with leaks in pads but (knock on wood) this one seems to be a great balance between weight and durability. earlier this year, Stu and I started camping with just a tarp (just like my grandma used to). We loved the simplicity of it, however with some of the trips we are doing this year we were worried about bugs keeping us up at night, so we got the MSR Thru Hiker Mesh House. It weighs next to nothing and is easily erected under your tarp using your hiking poles. Just like my toque, I take a Patagonia Nano puffy jacket with me everywhere I go, even on day hikes. It almost always comes in handy on hikes with a lot of elevation gain. For this hike, I am taking a pair of water-resistant hiking pants made by Patagonia. They stand up well for moderately wet hikes and are somewhat insulating, making them a great second layer over long underwear for around camp on a chilly evening. I tend to be more sensitive to heat stroke than sunstroke and therefore don’t usually wear a hat when hiking. That said, I’ve recently discovered the Sombrio Digger hat which has a light mesh fabric that doesn’t hold in heat like a ball camp and has a wide brim for extra protection – and for when you want to enter into full tourist mode. It’s also super packable and doesn’t take up much space. I take my thin wool icebreaker toque with me almost everywhere I go in both the winter and summer. It packs up small and is super handy for cold alpine nights. I bring both. The bladder keeps me drinking water all day without stopping and also allows me to fill up enough while we hike for cooking at camp later. The bottle is great for adding hydration tablets (you don’t want them in your bladder as they make it slimy and gross and you can’t get the flavor out), it is also great for scooping water out of streams to fill your bladder. I bring an insulated one for making tea around camp and sometimes taking it with me on cold start mornings. I’ve just purchased this for water treatment. My cousin had one on our West Coast Trail trip and we loved how fast and easy it was to use. The electric pump is a splurge, but it’s small and light, and after a long day hiking, having it blow up my air mattress while I make dinner is almost as good as someone handing me a margarita! my hiking pack is the Arc’tyrex Altra 62 and is weatherproof, otherwise, I would bring a pack cover as well. if you time it right, you can stop by Skoki Lodge for High Tea on this hike. I bring Bronner's soap because it is biodegradable and also works on dishes and hair. I bring the unscented one as I assume bears love the smell of lavender and peppermint as much as I do. Disclaimer about my First Aid/Emergency kit - it is a collection of things I've bought, found, and been given over the years. Do some research if you are planning on building your own, there is a lot of good information out there! But always be prepared. This will be my first multi-day hike since I started eating on the SIBO diet. I've prepared breakfasts and dinners (Pad Thai recipe here) in Ziploc freezer bags so that I can simply add boiling water to them. I've also prepared 'just add water' versions of my smoothies that I make at home and will be eating a garlic-free salami with homemade almond flour crackers for lunch. Additionally, I've packed fruit leathers, individual packs of almond butter, and homemade coconut cream fudge! The great thing about hiking is indulging in all those healthy fats! Put everything except the slivered almonds into a medium Ziploc freezer bag. Fill with 1/2 cup to 2/3 cup boiling water. Add almonds. Enjoy. When I'm camping I take lunchbox-sized almond milk tetra packs and a blender bottle to make these, but for backpacking, I just add water to the powder and use a spoon to mix it up. A few years ago, when I was feeling at my worst, I committed to doing a multi-day hike on the Sunshine Coast Trail with a friend. I was out-of-shape due to simply being too exhausted to do anything active and the night before the trip I picked up my backpack for the first time and burst into tears. It was so heavy. I couldn't imagine hiking with it. I did and I finished the trip. But throwing my bag on tonight felt so great! It can be easy to forget that I am making gains in health and fitness - and this week it was especially hard to remember that, but when I threw my pack on with ease, it put the biggest smile on my face!